Microsoft has long strived to make its products accessible to the disabled, and it’s Dan Hubbell’s job to make sure you know that. As the technical evangelist for Microsoft’s Accessibility Business Unit, Hubbell works to increase customers’ awareness of accessible technology solutions in the marketplace. 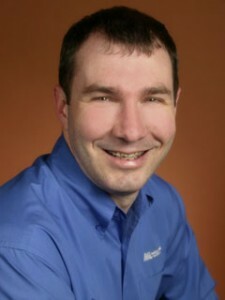 He also oversees the company’s vendor program, which includes more than 180 assistive technology manufacturers whose products are designed to work with Windows, Office, and other Microsoft products. Hubbell talks about trends in assistive technology and what we can expect the future to look like. Q: What trends in assistive technology will we see over the next 10 years? A: Two key trends I am seeing are increased customization and increased portability of assistive technology. Consumers, especially those with disabilities, have a much greater need for flexibility in how they interact with computers and technology. More and more, computers will adjust to a person and the environment dynamically rather than requiring a person to adjust to how they use the computer like they do today. And with the continued miniaturization of technology it is increasingly possible to carry many of these tools with you. Our hope is to see technology that is flexible and portable enough to be accessed by anyone, anywhere, no matter what their abilities are. A: We are currently seeing a number of portable products coming to market like software that works on a GPS-enabled cell phone that can speak walking directions for a person with a visual disability, such as the Mobile GEO solution that you wrote about for BusinessWeek. Q: What about advances in newer assistive technologies, such as speech recognition? A: Speech recognition for years has been becoming more mainstream and is increasingly integrated into computers and consumer electronics. But speech is just one of many new ways for consumers to use and interact with technology. Advances in touch, gesture, and optical tracking will allow users to use computers in a way that is most natural to them. Say you’re typing a document in Microsoft Word and you decide you want to switch the order of two paragraphs. You reach up to the screen and highlight the first paragraph with your finger and move it to where you want it to appear in the document. Then you give the computer a spoken command to print the document. Having these various options are critical to success for people with disabilities in the workplace. Q: Will we see any improvements in accessibility for products used in the home, such as washing machines? A: Appliances that once were usable by most people have become increasingly inaccessible to people with disabilities. Manufacturers of copiers, microwave ovens, and washers and dryers, to name a few, have replaced physical push buttons and dials with touch screens and flat panel buttons for operation. These are designed to improve the user experience, but people who are blind or mobility impaired can’t use them. New technology advances in home and office appliances — including microwave ovens, copiers, VCRs, thermostats, ATM machines, or kiosks — will make it possible to operate them remotely. The remote controlling device could be a personal computer, laptop, cell phone, or other mobile device that will be able to communicate remotely to manage and operate a variety of home and office appliances. Q: What’s one technology that you’re most excited about? A: I am excited to see that eventually more accessibility devices will be integrated to work with mobile technology like GPS, radio frequency identification (RFID), text-to-speech, and even Tag technology. These mobile devices might be woven into clothing, worn in the ear, attached to a wheelchair, or even become a new form of fashion jewelry. They will not only be able to manipulate our environment by turning lights on or off, or adjusting a thermostat, but they will also inform us of where we are and provide critical information about our environment. This will put everyone in control and allow them to interact and manipulate their environment, regardless of ability, through the method of their choice. The next generation of technology will be life changing for everyone, but especially for people with disabilities. When an employee who is blind can easily navigate through a new office building with no assistance other than the computer he always carries with him as a lapel pin, we’ll know the future has arrived. For more information go to Microsoft’s Accessibility page. At the Lighthouse in NYC we have the highest regard for Dan Hubbell and Microsoft and we love conversations about what’s coming along in accessible technology. We could line up clients (for miles) who are interested in using a computer with voice recognition or getting around town with the help of audible GPS in their cell phone. The real question is when? Recently, I was told that my expectations of voice recognition technology for people with impaired vision (accessible totally by spoken commands not visual access) is still “Star Treck technology” and we’re not quite there. When? Wehn will we be able to operate voice recognition like Sync in a ford, without seeing the dialog boxes and menus, and without bridging 3 software packages (at a cost of thousands)? When will GPS work on city streets where people with impaired vision need it, and when will it be available at the AT&T or Verizon store, and not cost $900? It’s not quite here, but it is surely coming not just because it’s good for people who can’t see, but because both voice recognition and GPS is better for everyone! Interesting car related information, I love reading this kind of stuff. Your report stirs up thoughts which I need to consider before buying my next car. Its WP but custom design. Thanks!